Sinigang is a Filipino soup or stew characterized by its sour and savory flavor most often associated with tamarind (sampalok). It is one of the popular viands in Philippine cuisine. I would say " pork sinigang" is one of my comfort food. This is one of my favorite food during rainy or cold season aside from Binignit. 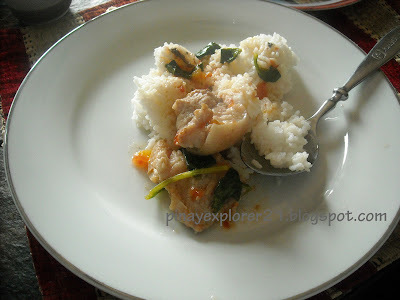 This recipe is from my friend Rachel, she loved to make sinigang for everyone, I call it her specialty, although we do change it a little bit by adding spinach instead of bokchoy or petchay. This sour soup is just so perfect for friends get together, potluck party and for the whole family to enjoy. Rachel don't mind sharing her delicious sinigang. I'll promise you, you won't disappointed how good is it. C'mon let's start cooking! -Used whatever parts of pork you like and vegetables like green beans, peppers, eggplant and much more. 1.) In large pot, bring the cut chunk pork to boil, Let it simmer until the pork is tender for about 45 minutes. 3.) Add the spinach, salt and pepper to taste. Remove from the stove. 4.) Best when serve hot along with rice. Enjoy! I'm in-love with this dish too, Thanks! Mmmm, how soothing this sounds! I love this! Sabaw at gulay lang, ulam na sa akin. My brother sometimes add bagoong and the taste is good too. Comfort food like your pork sinigang is just what we need for our autumn weather. Delicious! Yey one of my favorites! The stew looks so yummy.. I love sinigang!! It's been a while since we had this on our table. :) I'll cook this soon. This is my son favorite. Will try this new style soon. Oh my gosh I miss Pinas! This dish will gonna take you back home:) Thanks! Of all dishes, This is my favorite. Kontra sipon pa. Plus I love sour food so much. Yum! Just the mention of sinigang is enough to make me salivate. Hehhehe.. it does sound good. Thanks! Sarap! We just had sinigang yesterday and with this I think I want to have it again. masarap nga, gusto nga din ng sinigang now. Thanks! I wish I could have this for lunch today! I hope you have a great weekend! wow sarap! gusto ko nyan for dinner tonight. yummy! 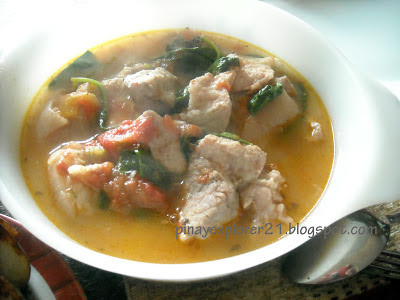 pork sinigang is one of my favorite dish.. This is my daughter's all time favorite dish. I like this when it comes with gabi. It made even more flavorful. I'm already starting to get hungry here. I like it that way too, wala lang gabi dito..:) Thanks! Saraaap! I haven't tried sinigang with patis yet. I usually eat mine with bagoong. Perfect for the upcoming rainy season! You should gve it a try, masarap! Thanks! heheh that's like a good plan :) Thanks! spinach? haven't tried sinigang with it. 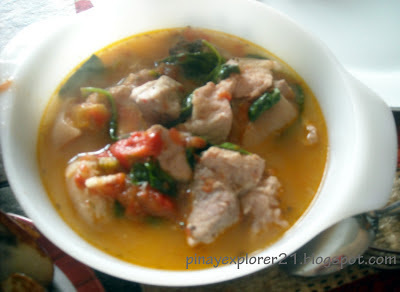 What I really love to cook sinigang is the Pata slice. Love it with lots of taro making the soup creamy.